Joint with the hair, we have seen now two new important elements which we cannot ignore: Hathor and light. Hathor is mentioned as the « guide of the boat, who keeps ropes kasu in front of the rudder in the West ways… », she is « the lady of the light, who guides the Big One who is tired ». 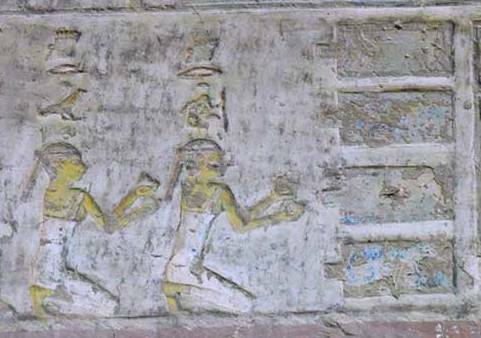 Hathor and light means that the text is referring to the lunar Hathor, the guide during the night. According to an Egyptian tradition, Hathor was patroness of deceased; she was a goddess that very soon became the goddess of The West and the imagery put her on the flank of the mountain, the place of the sunset and where the dead ones got into the Underworld. The goddess Hathor in the flank of the west mountain ready for receiving the dead. 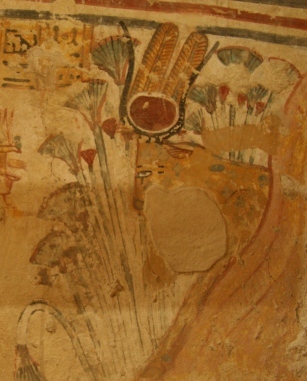 Painting from the tomb of Shuroy in Dra Abu el-Naga. XIX Dynasty. Phot: Mª Rosa Valdesogo Martín. Religious texts show that from very soon Hathor was a goddess who received the dead, who sheltered him, who helped him in reaching the eternity; in the Afterlife the dead was in the entourage of Hathor and she was the main one in the necropolis, that is why one of her epithets was “Hathor at the head of the Necropolis”. Hathor helped the dead to go up to the sky, the same sky where she is guardian and that is his own body as celestial cow. 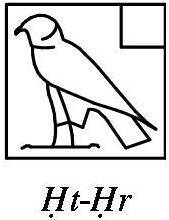 In fact, the Egyptian name Hathor means « The house of Horus » . Hathor grants the dead be sitting in the sky, that according to E. Drioton would be a lunar paradise, so a night sky. Not only Hathor has a relationship with the moon, with the night sky and with Horus, she also is connected somehow with the Udyat eye. There are several examples of Hathor with a lunar character, so she is the “left eye of Re” , the “eye of Re in the sky during the day and the eye of Horus which makes the darkness bright” . It is well-know the relationship between cattle and the moon, because the horns are assimilated to the crescent quarter. This aspect contributes to that image of Hathor as a sky goddess, which exist in Ancient Egypt from the Predynastic period. 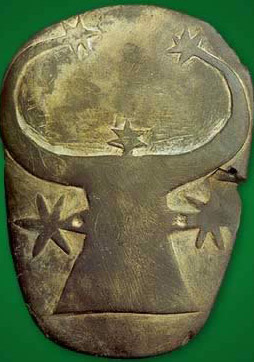 We see it clearly in the cow-head palette from Gerzeh in Cairo Museum with the image of a cow rounded with stars making a very ancient image of a celestial cow. But Hathor, is mainly a mother goddess, a celestial cow whose main role is feed people and gods and, so that, has the faculty of giving the life. Maybe that is the reason why, as a mortuary divinity, Hathor also took part in the deceased’s resurrection and was assimilated with Isis. The maternal nature of the cow makes that animal a symbol of rebirth. In this sense Hathor should be consider as a manifestation of the primeval mother. Because “horns of cattle, that characterize great fecundity gods, are the emblem of the divine “Magna Mater” and because moon and fertility go together. Hathor, as lunar deity, is also guide of the boat and she maintains the ropes. In this regard we consider interesting to refer to chapters 404 and 405 in the Coffin Texts, where the bow rope is assimilated to the braid of Isis. It is the night boat, which carries the deceased when he revives during the night, so it is the moon. The shape of the boat could remember the quarter of the moon, so the boat crescent-shape will be one of the first means of transport in Egyptian culture, as it will be for the dead once he will be in the Afterlife. In fact, the usual head-dress for lunar deities is a full moon over a crescent, in the same way the deceased reborn as a full moon will travel in the Hereafter in the lunar boat, identified with the crescent. Head-dress of Khonsu with full moon over the crescent. Relief from the temple of Khonsu in Karnak. XIX Dynasty. Photo: Mª Rosa Valdesogo Martín. So, what we are facing is a lunar rebirth. In that rebirth we have seen the important role of the hair element. The feminine hair appears related to water, maternity, sexuality…and also now to the moon. If hair is related to water and moon, the lock of hair swt in mourning should also have a connection with the lunar resurrection of the dead, with the goddess Hathor in her lunar nature, as guide of the boat (crescent of the moon) in the dark of the night sky. 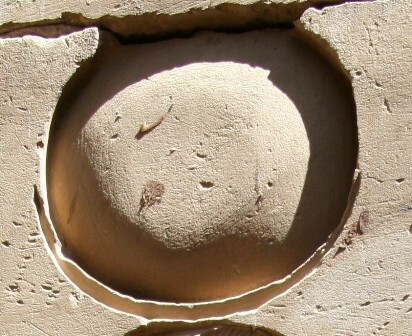 Hathor capital. Bahr el-Yussef museum. Photo: Mª Rosa Valdesogo Martín. So, we have the mourners and /or the locks of hair swt in the moan, that is, mourning on earth during the funerals while the goddess Hathor in her lunar nature is in the night sky with her both ringlets on each side of her frontal face; Hathor is a grant of the deceased’s resurrection and she guides the boat, which bow rope is the braid of Isis. In the funerary ceremony the two locks of hair of the mourners could be the announcement of the lunar resurrection. E. Drioton, 1985, p. 188. A. Erman, 1952, p. 50. E. Drioton, BiOr 15, p. 189. A. Mariette, 1875, IV, 77 a; en Ph. Derchain, 1962, p. 46. A. Mariette, 1875, I, 112, 7(A). A. Mariette, 1875, VI, 144, 2-3(J). According to F. A. Hassan it could represent Orion (F. A. Hassan, 1992, p. 314). 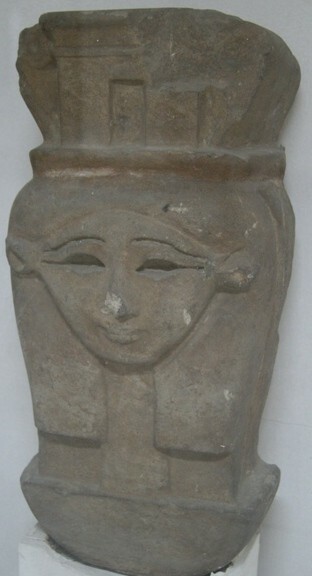 One epithet for Hathor is “Mistress of Life” (A. Mariette, 1875, I, 26 f.). According to a version of the Osiris legend, Isis lost her head and Thoth replaced it with a cow’s head (Pap. Sallier IV). 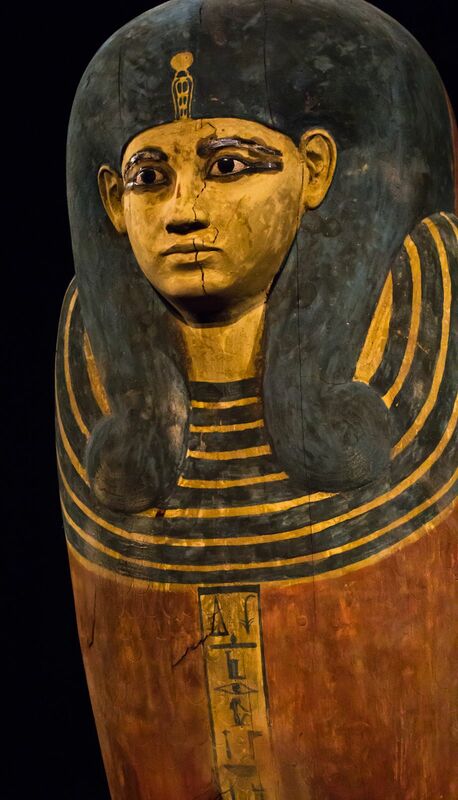 In addition, sometimes Hathor is called with the epithet of “Beautiful One of Osiris” (A. Mariette, 1875, VI, 3, 3). F. A. Hassan, 1992, p. 315. M. M. Eliade, 1970, p. 146. G. Durand, 1979, p. 238.